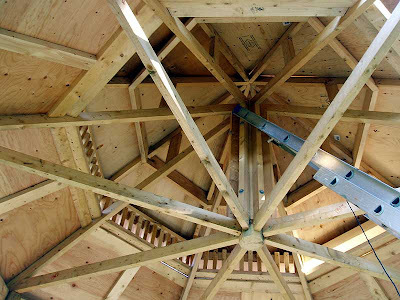 The Witch's Island: Gazebo Roof Is Almost Done! 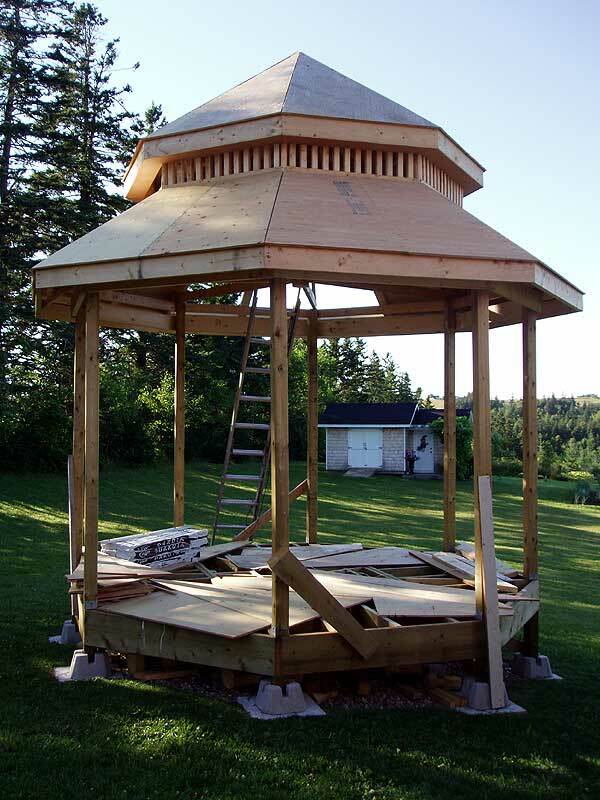 There hasn't been an awful lot to say about the gazebo lately but we are still making some progress. With Hubby back to work last week he is only getting a few hours a day to build. That said, he has the secondary roof complete except for the fascia boards and the primary (lower) roof would be at the same point but he ran out of plywood. The new truck is out of commission for a few days meaning he can't get any more so he is working at some of soffits on the lower roof and putting in some more of the spindles. The budget for this project is still under control. It seemed for a while that he was bringing home hundreds of dollars worth of materiels every day but we still have about $1500 left of our original estimate and most of the major components have been bought including a nice wooden entry door. It would be great if we can't make the scheduled completion date to at least come in under budget. If he wants any more projects from me he'd better keep that in mind! WOW!!! 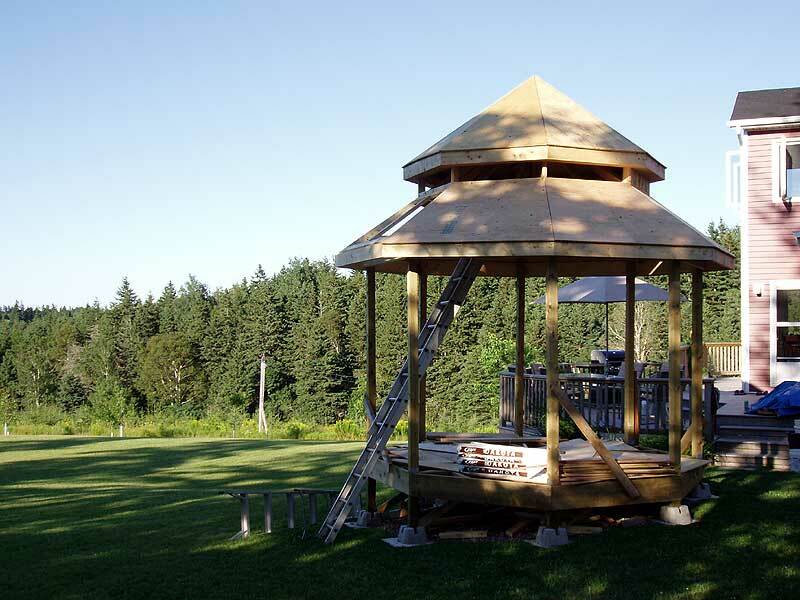 !The Gazebo is really coming together beautifully!! I could just sit and look at the ceiling, but you have an amazing view that distracts from that! :-)) I can't wait to see the finished project and I hope it stays under budget!! 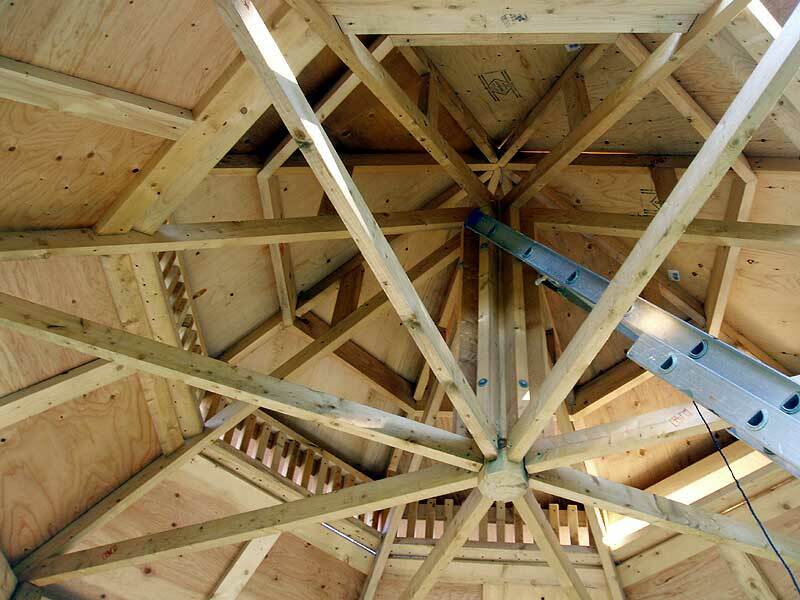 are you putting cedar shingles on the roof? Glad you're keeping to your budget, fingers crossed you can keep it under budget. 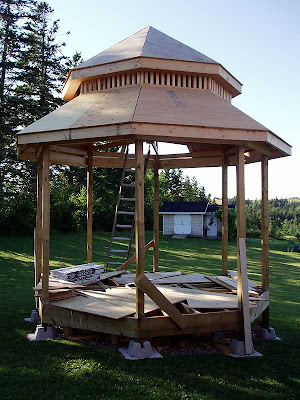 The roof of the gazebo is going to be done in black asphalt shingles to match the potting shed but we are intending to use cedar shingles to cover the lower parts of the outside walls. Looking great! Boy, I took a good look at your pictures and it seems like it's really complicated work! Kudos to your hubby! Just think how wonderful it's going to feel sitting in your new gazebo and drinking that first cup of coffee early in the morning....at least, that's what I'd probably do!